Thank you for your interest in Eraselet, LLC. My husband, Bryan Ricci, invented the Eraselet as a way for our three young daughters, all in elementary school, to keep from losing their erasers. All three daughters love bracelets, so why not an eraser in the form of a bracelet? The product, a revolutionary eraser in the form of a bracelet, was given the title "Eraselet", patent-pended and trademarked through the USPTO (United State Patent and Trademark Office). It was important to both Bryan and I that our product, Eraselet, be made in the United States. It just didn’t seem right, in our country’s current financial situation, to send good jobs overseas. After being told time and again that we would have to go outside the US to find an affordable manufacturer, we were more than pleased when we found Alliance Rubber Company in Hot Springs, Arkansas! Alliance Rubber has been family owned and operated since 1923. By staying firm to our commitment, every time you buy an Eraselet, you are helping to provide jobs right here in the USA! Eraselet has also provided us with a way to help others. We are excited to be able to share our product with you, to help you to Erase Your Cause! Through our non-profit, Erase World Hunger, we are able to provide food, clean drinking water and love to children in this country as well as countries all around the world. What does your non-profit do and how can we help you to Erase Your Cause? 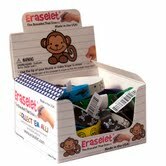 Whether you are looking for an awareness Eraselet® to Erase your cause, an inexpensive fundraising item, or a promotional product for your business to get into the hands of kids, Eraselets are your answer! Kids love Eraselets! Let your custom imprint become a collectible to kids and spread your distinct message! They also offer Eraselets to schools, PTO/PTA @ wholesale prices to make 100% profit! Also, we can make custom orders w/250 qty minimum purchase! You can purchase Eraselets at Dollar General Market Stores for just $1! Look for this box in your local Dollar General stores. Eraselets are also available in packages of 6 online. They are $4.95 for a package of 6 Eraselets. My kiddos just thought these were the neatest thing! My 3 teenagers have been using Eraselets school for almost a month. All 3 of them state they they work great and they do erase! My youngest was so excited that they worked. Now he can keep up with his own eraser! All My kids liked the way they fit and how handy they were. They also felt special at school because non of Their friends had heard or Eraselet nor had one! My kids got to tell others about them and where to purchase them! I like that the kids can have an eraser and be stylish at the same time. The themes for Eraselet are great for any child. My kids haven't lost these erasers yet! I give that an A+ in my book. The price is awesome. At $1 you can collect them all! disclosure~ I received a package of 6 eraselets and 3 single eraselets in exchange for my review from Eraselet. Listia~ get and give Lots of stuff!